I would have to say that there are easily a dozen cocktail recipes from Cuba in the Gentleman's Companion, Vol II. Charles H. Baker, Jr. must have spent many years there in a pickled haze. That said my next drink was one of Baker's trifecta* of "Bacardi Drinks", Wil P. Taylor's HOTEL NACIONAL SPECIAL. Wil P. Taylor is apparently a fellow bon vivant that Baker and his crowd encounter on a trans-Atlantic cruise several years before. Taylor ends up managing the grand Hotel Nacional in Havana around the time of the Revolution of 1933 that brought Generalissimo Batista out of the barracks and into the Presidential Palace. 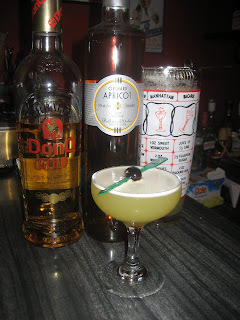 He is another Bacardi-phile and basically adds apricot brandy and pineapple juice to the Daiquiri, hold the sugar, and successfully keeps the sweetness. Shake with cracked ice, stain, serve in tall cocktail glass (I went with a coupe glass)with a stem. The pineapple juice provides a really nice foam that one would usually need egg white to create. It also brings in a sweetness that doesn't overwhelm the citrus of the lime or the hint of apricot. A refreshing rum cocktail as we say adios to summer. You can get your own Hotel Nacional Special at Clover Club in Brooklyn, NY. I believe it is on their latest menu. *Winning is the DAISY de SANTIAGO, Placing is the DAIQUIRI.